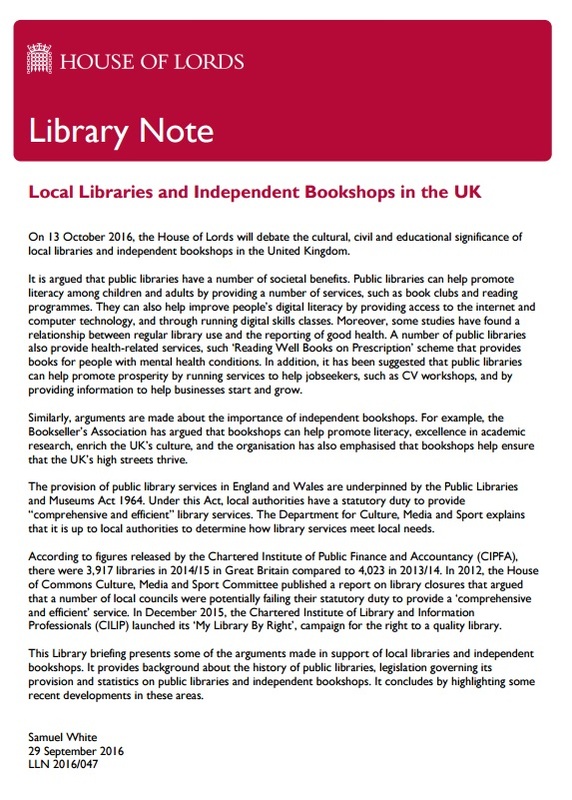 On 13 October 2016, the House of Lords will debate the cultural, civil and educational significance of local libraries and independent bookshops in the United Kingdom. It is argued that public libraries have a number of societal benefits. Public libraries can help promote literacy among children and adults by providing a number of services, such as book clubs and reading programmes. They can also help improve people’s digital literacy by providing access to the internet and computer technology, and through running digital skills classes. Moreover, some studies have found a relationship between regular library use and the reporting of good health. A number of public libraries also provide health-related services, such ‘Reading Well Books on Prescription’ scheme that provides books for people with mental health conditions. In addition, it has been suggested that public libraries can help promote prosperity by running services to help jobseekers, such as CV workshops, and by providing information to help businesses start and grow. Similarly, arguments are made about the importance of independent bookshops. For example, the Bookseller’s Association has argued that bookshops can help promote literacy, excellence in academic research, enrich the UK’s culture, and the organisation has also emphasised that bookshops help ensure that the UK’s high streets thrive. The provision of public library services in England and Wales are underpinned by the Public Libraries and Museums Act 1964. Under this Act, local authorities have a statutory duty to provide “comprehensive and efficient” library services. The Department for Culture, Media and Sport explains that it is up to local authorities to determine how library services meet local needs. According to figures released by the Chartered Institute of Public Finance and Accountancy (CIPFA), there were 3,917 libraries in 2014/15 in Great Britain compared to 4,023 in 2013/14. In 2012, the House of Commons Culture, Media and Sport Committee published a report on library closures that argued that a number of local councils were potentially failing their statutory duty to provide a ‘comprehensive and efficient’ service. In December 2015, the Chartered Institute of Library and Information Professionals (CILIP) launched its ‘My Library By Right’, campaign for the right to a quality library. This Library briefing presents some of the arguments made in support of local libraries and independent bookshops. It provides background about the history of public libraries, legislation governing its provision and statistics on public libraries and independent bookshops. It concludes by highlighting some recent developments in these areas.